Condimento di Beatrice is an impressive product. It is thick, smooth, velvety and the acidity is just right. Made only using high-quality Lambrusco and Trebbiano grapes. The grape must is cooked and reduced and then aged for 7 years in barrels of different woods. Each barrel is unique and confers to the vinegar a unique signature. This product is excellent considering the quality and the price. It is ideally used on top of mature cheese such as Parmigiano Reggiano, foie gras, cooked vegetable and grilled steaks, and why not on desserts like ice creams or strawberries. 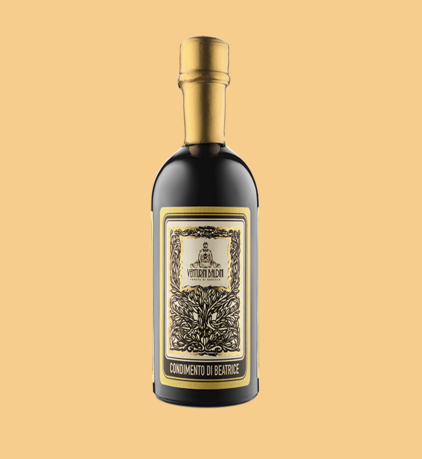 Excellent balsamic vinegar from Reggio Emilia. Also excellent price for this kind of high quality. Highly recommended.